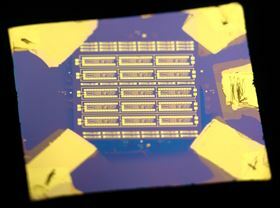 This photo shows molybdenum disulphide transistors on a microprocessor chip. Photo: Hermann Detz, TU Wien. The first fully-functional microprocessor logic devices built from a few-atom-thick layered materials have been demonstrated by researchers from the Graphene Flagship, working at TU Wien in Austria. The processor chip comprises 115 integrated transistors and is a first step toward ultra-thin, flexible logic devices. Using transistors made from layers of molybdenum disulphide (MoS2), the microprocessors are capable of 1-bit logic operations and the design is scalable to multi-bit operations. The research is reported in a paper in Nature Communications. The MoS2 transistors are inherently flexible and compact, meaning they could be directly translated into microprocessors for fully flexible electronic devices, wearable phones or computers, or for wider use in the ‘internet of things’. The transistors are also highly responsive, and so could allow low-powered computers to be integrated into everyday objects without adding bulk. "In principle, it's an advantage to have a thin material for a transistor. The thinner the material, the better the electrostatic control of the transistor channel, and the smaller the power consumption," said Thomas Mueller at TU Wien, who led the work. Focusing on increasing the computing power, Stefan Wachter at TU Wien, who is first author of the paper, said "Adding additional bits of course makes everything much more complicated. For example, adding just one bit will roughly double the complexity of the circuit." Compared to modern processors, which can have billions of transistors in a single chip, the 115-transistor devices are very simple. However, this new technology is still at a very early stage, and the team have concrete plans for the next steps. "Our approach is to improve the processing to a point where we can reliably make chips with a few tens of thousands of transistors. For example, growing directly onto the chip would avoid the transfer process, which would give higher yield so that we can go to more complex circuits," said fellow author Dmitry Polyushkin, also at TU Wien.